IceCube is one of the world’s largest experiments, consisting of a cubic kilometer (that’s about a fifth of a cubic mile, or a billion tons) of ice, located well below the snowy surface at the south pole of our planet. It’s designed to detect neutrinos from outer space that happen to hit something within or just outside its immense volume. In this article I’ll tell you how a bit about how it works. To understand the motivation for this experiment, it’s good to start with a little review of neutrinos. There are three types of neutrinos, and three types of anti-neutrinos, but for the moment, rather than talk about what distinguishes these types, let’s focus on the things that all of these neutrinos and anti-neutrinos have in common. The main thing neutrinos have in common is that (unlike electrons and positrons and quarks and anti-quarks and photons and most other known particles) they are affected neither by the electromagnetic force nor by the strong nuclear force. [Here’s an article on the elementary particles and forces.] They are affected by the weak nuclear force. But this force is so weak that neutrinos can pass readily through large amounts of ordinary matter. This makes them quite unlike electrons, unlike photons, and unlike protons, neutrons and other hadrons. In fact, trillions of neutrinos are passing through your body every second, a fact that was unknown to us until recent decades. Since any attempt by humans to detect neutrinos (or, indeed, anything else) involves building some sort of device made from ordinary matter, the fact that neutrinos basically go right through ordinary matter without leaving any trace is rather inconvenient for anyone who wants to observe them. Think how inconvenient it would be if photons went right through our photon detectors (you know, the things on our faces that we call “eyes”) without leaving a trace! Of course this is part of why we have eyes that detect photons, but we don’t have eyes that try to detect neutrinos — the latter wouldn’t be of much use. The scientist has to play the role of the patient spider with a very big web, or of a laconic fisherman with a vast net, awaiting that rare neutrino that isn’t looking where it’s going and blunders into the trap. And this is where IceCube comes in. IceCube is, truly, the stuff of science fiction turned into fact. It is a giant cube of ice — pure, clear ice, free of bubbles and almost perfectly transparent. On our planet, such a giant quantity of perfect ice can only be found in the high plains near the South Pole, deep beneath the surface. And into that ice, scientists have repeatedly drilled two and a half kilometers (more than a mile and half) deep, using nothing more clever than hot water. As illustrated in Figure 1, into each drill hole (half a meter [a foot and a half] wide), scientists have placed a long string, the bottom kilometer of which is studded with sixty evenly-spaced instruments, called “phototubes”, that are able to observe very small amounts of light. Way down there, over a thousand meters into the ice (many thousands of feet), it’s incredibly dark. No light from the Earth’s surface makes it to that depth. So anything that a phototube can observe in the pitch darkness must be from something special. Fig. 1: The layout of IceCube. At the surface, near the South Pole, is the IceCube Laboratory and “IceTop”, a set of detectors whose purpose will be explained later. In 86 holes, each 2.5 kilometers long, and long-ago frozen solid again, were placed long strings with light-sensitive detectors in the bottom kilometer. The cube of ice around these detectors is where neutrinos, colliding with a nucleus in the ice and producing faint amounts of light, can be observed. certain limited information about the type of particle that created the collision, and the type of collision that occurred. This is illustrated in Figure 2, where two neutrinos are coming from the sky, one of them making a shower of particles that doesn’t include a high-energy muon going out, and one of which makes a shower that does include a high-energy muon going out. [The latter can happen when the incoming neutrino is a muon neutrino, which can be converted by the weak nuclear force into a muon during a collision. For more details on the collisions between neutrinos and atomic nuclei, see this article.] 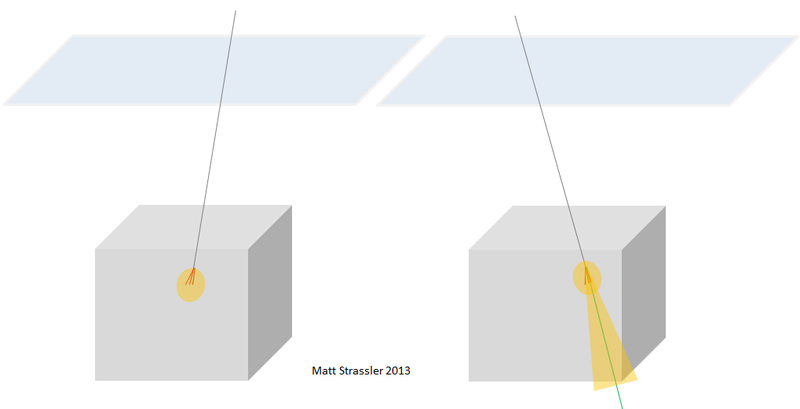 The same is shown in Figure 3, for neutrinos that entered the other side of the earth and, from IceCube’s point of view, are coming up from the ground. The reason to have both figures will become clear later. Fig. 2: Effects of neutrinos coming from the sky, passing into IceCube, and hitting an atomic nucleus. (Left) If a shower of particles is created in the collision that does not include a high-energy muon, it makes a small localized amount of light. (Right) If the shower does contain a muon, the light seen in the previous case is supplemented by the Cerenkov light from the muon, which travels much further than the other particles can. The only types of particles that can pass through over a kilometer of ice, or even a large fraction of the entire earth, to make it to IceCube are neutrinos and muons (and anti-muons — just as I’m doing for anti-neutrinos, I won’t bother to say “anti-muons” every time). So the only thing IceCube has to do, in order to detect neutrinos, is to make sure that it can distinguish their effects from those of muons. 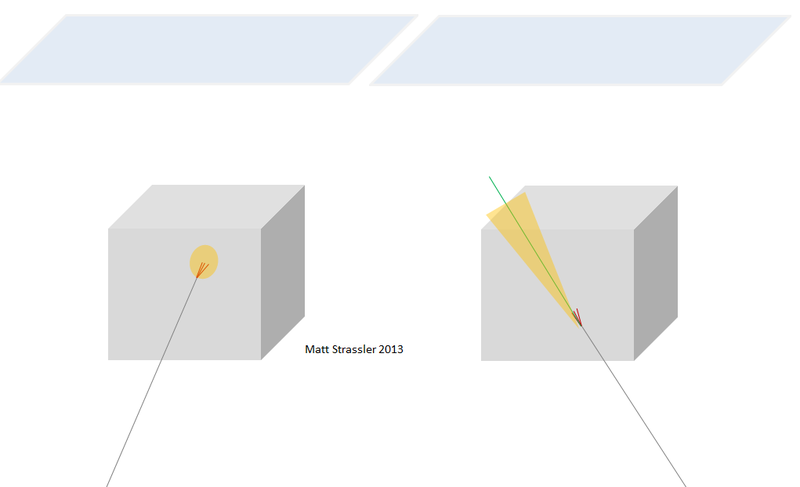 How that’s done is partly illustrated in Figure 6 below, where you see that the incoming muon deposits light as it enters IceCube, whereas an incoming neutrino doesn’t. We’ll come back to this point later. That’s really all there is to IceCube. Well, almost. I should also mention that there are a few phototubes (i.e. light detectors) placed at the surface of the ice too, in a cluster called “IceTop”; the purpose of these will become clear when we get to Figure 7. Still, by comparison with the detectors at the Large Hadron Collider, which it far exceeds in size, IceCube is a very simple detector. Fig. 3: As in Figure 2, but for neutrinos that have passed through the earth and enter IceCube from below. Unlike the “downward-going” neutrinos of Figure 2, hese “upward-going” neutrinos can’t ever be accidentally confused with a muon from a cosmic ray shower (Figure 6). The technology IceCube uses was tried out on a chunk of ice more than ten times smaller, in an experiment called AMANDA. And a similar idea (using Cerenkov radiation created by collisions of neutrinos with matter) has been used in big tanks of water instead of ice. But you can imagine it’s not easy to get yourself a tank of water as big as IceCube. In fact the only way to get so much water is to use an ocean — which is what an experiment called ANTARES is doing, putting strings of instruments deep underwater. Ice has some disadvantages — once the phototubes are put into the warm-water holes and the holes freeze, there’s no way you can get them out again to do any repairs if something breaks. On the other hand, in the ocean there are currents that will move your detectors around, and a lot of living creatures make light that will distract you from what you’re trying to observe. In any case, it’s good that there are multiple experiments using different methods, so that we can compare their results and figure out which aspects can be trusted. What natural processes generate neutrinos and anti-neutrinos that IceCube can measure? IceCube can detect and measure the energy of neutrinos whose energies exceed about 100 GeV — about the mass-energy [i.e. E=mc² energy] of a Higgs particle. Now what’s that good for? Fig. 4: A cosmic ray (dark red) strikes a nucleus in the atmosphere, creating a shower of particles (various colors). Of these, mainly muons (green) and neutrinos (grey), and their anti-particles, reach the ground. These may be detected by IceTop (at surface), and some will reach IceCube, far below the surface. Well, first, here are some neutrinos IceCube is not good for: the more common, lower-energy neutrinos that come from decays of unstable atomic nuclei in the rock (an example of “radioactivity”), neutrinos from the sun’s internal furnace, and neutrinos from the heart of a supernova explosion. These neutrinos have energies of a few thousandths of a GeV to a few hundredths of a GeV, far below what IceCube can detect efficiently. None of these are IceCube’s targets. By far the most common neutrinos that IceCube observes are “atmospheric neutrinos”. These are actually produced in the atmosphere of the Earth by cosmic rays. Cosmic rays are very high energy particles, typically protons, that hit an atomic nucleus in the high atmosphere, thereby creating a shower of hadrons (the general term for particles made from quarks, antiquarks and gluons), along with photons, electrons and positrons [ie. anti-electrons]. Some of the hadrons then in turn can produce neutrinos when they decay. These neutrinos have a huge range of energies, with the number decreasing rapidly as the energy increases. 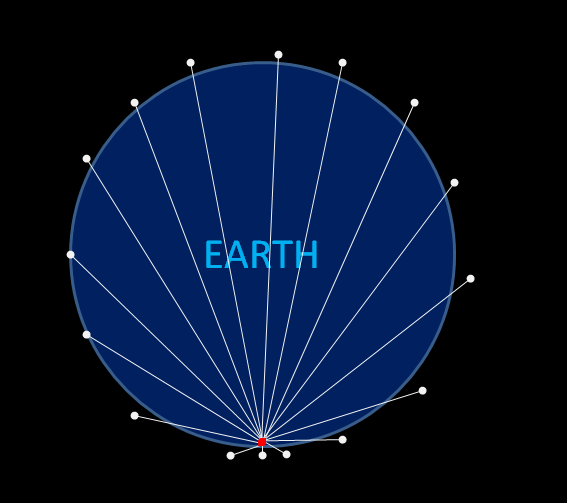 They may come from all around the Earth, as shown in Figure 5; the cosmic rays come in from all directions, and hit the Earth’s atmosphere at all locations above the Earth’s surface, so they can create neutrinos that can reach IceCube from every point above the surface of the earth. An interesting fact of geometry is that IceCube (and any similar detector) observes equal numbers of these neutrinos coming from all directions — although the ones that come from underground (i.e. from the north in IceCube’s case) traverse thousands of kilometers (miles) of rock, while those that come from overhead travel through scarcely a kilometer (mile) or two of ice before reaching the detector. Fig. 5: Atmospheric neutrinos may be created (white dots) anywhere around the earth, and traveling (like their parent cosmic rays) in any direction. Those (white lines) that happen to pass through IceCube (red cube) may come from anywhere around the globe, with equal probability. There’s a challenge for measuring the neutrinos that come from overhead. Neutrinos and muons are both very common in a cosmic ray shower, but a muon is much more likely to produce a signal in IceCube than a neutrino is, so most of what IceCube sees coming from overhead is effects of muons, not neutrinos. Most of the time this signal is clearly that of a muon and not a neutrino (Figure 6), but every now and then something odd will happen, and the light that distinguishes an incoming muon from a neutrino won’t get picked up. In this case, IceCube will measure a “fake neutrino” that was really a muon. Even though this is rare, there are so many muons that these fake neutrinos do have to be accounted for, especially at low energy. Fortunately, most of the cosmic-ray muons don’t make it down a kilometer and a half into the ice. And even more fortunately, muons that are coming from cosmic-rays that are below the horizon at the South Pole have to travel through many hundreds or thousands of kilometers of Earth to get to IceCube — and they won’t make it. So therefore, while muons can create fake downward-going neutrinos (downward meaning, as usual, “toward the Earth’s center”), they can’t create fake upward-going neutrinos. So upward-going neutrino signals are pure — essentially always from real neutrinos. Fig. 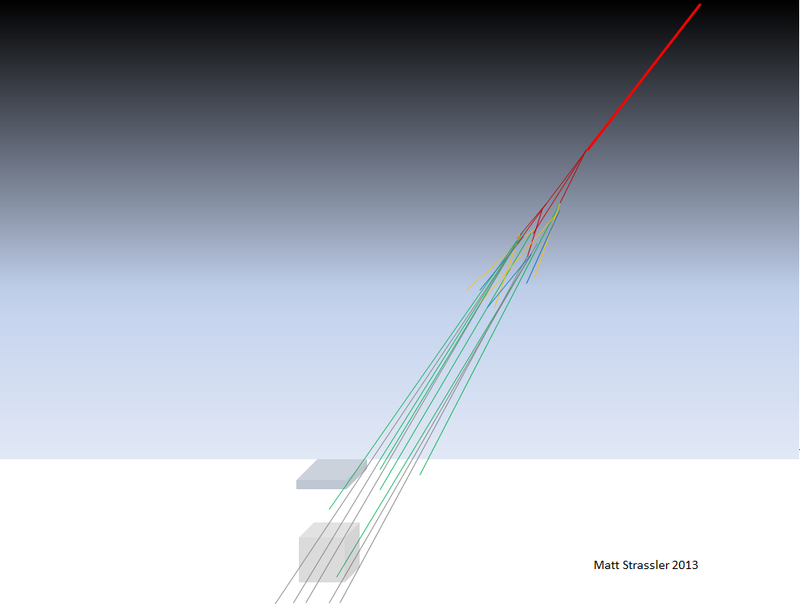 6: Cosmic rays produce many muons, and a few of these make it down from overhead to IceCube depth. But the muons bring Cerenkov light with them into IceCube, unlike the neutrinos shown in Figure 2. Most of the time this can be used to distinguish muons from neutrinos. Note muons cannot travel through a substantial portion of the Earth without stopping, so they can’t emerge from below and thus cannot be confused with the neutrinos shown in Figure 3. Now, what about other neutrinos? The ones that IceCube is most likely to detect, and that are its main target, are called “astrophysical neutrinos”. What are these? Well, one thing we are confident of, but don’t understand in detail, is that out there in space somewhere, something truly dramatic is responsible for making the very highest-energy cosmic rays that we observe — protons and atomic nuclei with energies approaching a million million GeV, and probably beyond. (Remember the Large Hadron Collider only accelerates protons to energy of a few thousand GeV.) Now, it is almost impossible to imagine how this acceleration process could occur without there being collisions, within this distant natural particle accelerator, between these protons and other matter that they may encounter. And those collisions would create neutrinos, with energies somewhat lower than the ultra-high-energy cosmic rays, but still higher than any neutrinos previously observed. We don’t know how many of those neutrinos might be out there, but we have reason to believe that there might be enough for IceCube to detect… and maybe it already has done so? The main goal of IceCube is to discover astrophysical neutrinos and help figure out, if possible, what is making them. This requires not only observing the neutrinos but also looking, with ordinary and exotic telescopes, for photons (visible light, or radio waves, or gamma rays — anything!) that are coming from the same place on the sky, perhaps at nearly or exactly the same time. For instance (see here and here for an example), if a big explosion somewhere out there in space generates big magnetic and electric fields that can accelerate protons and electrons to extreme energies, various interactions between those protons and electrons and other gas that is flying about may generate both high-energy photons and very high-energy astrophysical neutrinos. With luck, the photons could be detected by one or another special telescope at roughly the same time, and from the same direction, as IceCube detects a neutrino. [Yes, probably just one astrophysical neutrino would be observed at a time.] This hasn’t happened yet, somewhat to everyone’s disappointment, but it is still early days at IceCube. Atmospheric neutrinos come from overhead, along with large numbers of muons, a few of which make fake neutrinos. The number of such neutrinos and muons becomes small at high energy, so that sufficiently high-energy astrophysical neutrinos (with energies approaching a million GeV!) can be observed rather easily. But astrophysical neutrinos with energies well below a million GeV are lost in the sea of atmospheric neutrinos. Fortunately, there’s a trick for reducing the number of atmospheric neutrinos and atmospheric muons coming from overhead, and this can allow IceCube to detect astrophysical neutrinos coming from overhead down to energies of perhaps 10,000 GeV. This technique was used (along with other refinements) in IceCube’s recently announced and exciting data. The two highest-energy neutrinos in that data had so much energy that they were unlikely to be atmospheric in origin. But the remaining 26 (of which only 10 were expected) were identified only after using this trick. The trick is to set aside those downward-going neutrinos that are almost certainly atmospheric in origin, retaining only the astrophysical neutrinos, a few of the atmospheric ones, and a few fake neutrinos from atmospheric muons. While this can’t be done with complete reliability, it can be attempted as shown in Figure 7. The muons from a cosmic ray shower (Figure 4) arrive at IceTop (Figure 1) at the same time as the neutrino arrives at IceCube, to within a few hundred thousandths of a second. If this happens, the neutrino was almost certainly atmospheric. If not, then it probably (but not certainly) wasn’t. Throwing away the neutrinos that were clearly atmospheric reduces the number of neutrinos by a lot, but the IceCube folks claim they still see more neutrinos than they would have expected. Stay tuned over the coming years as the IceCube folks try to understand what this means. Have they in fact detected astrophysical neutrinos? Fig. 7: An atmospheric neutrino descending from the sky is typically accompanied by muons traveling in the same direction at the same time (see Figure 4.) Very few of these muons make it to Ice Cube, but some can be detected at IceTop. By contrast, an astrophysical neutrino, created far out in space, would not be accompanied by muons, and so IceTop would not see anything simultaneous with such a neutrino observed in IceCube. That was a good read. Thanks Matt. In your neutrino-types article you said “it is possible, though perhaps unlikely, that there are completely different interpretations. Indeed some serious alternatives have been suggested”. Please could you point to something on that? Very nice summary. Thanks.Question; You say that icecube does not detect low energy neutrinos. But water tanks have been used routinely to detect low energy neutrinos. Naively, there is not much difference between ice and water. So there must be significant background of low energy neutrinos they must eliminate. Is that right? How does IceCube differ, in sensitivity and selectivity, from bit tank-based detectors like SuperK? SuperK has a much smaller volume of detector, but it’s phototubes are more numerous and more closely spaced than IceCube (and it is shielded by rock, not ice, above). Does the larger detector volume allow IceCube to detect more neutrinos, despite the fewer photomultipliers? Do they detect different energy ranges? It’s an optimization problem. Since SuperK [for non-experts, a big tank of water underground in Japan, surrounded on all side by photon detectors, also looking for Cerenkov light] is smaller, and has much more dense instrumentation, it is suitable for detecting neutrinos that are more numerous but have less energy than those IceCube is aiming at. The rare high-energy neutrinos are too rare for SuperK — you need large volume, or you simply won’t see any inside your detector — but since they have more energy they make a more dramatic signal, so in detecting them, you can get away with fewer phototubes. Of course more phototubes would be better, but there’s a cost issue to be optimized as well. I’m not an expert on the phototubes; I don’t recall there being any dramatic differences between those at SuperK and at IceCube, but if there were they might have escaped my notice. 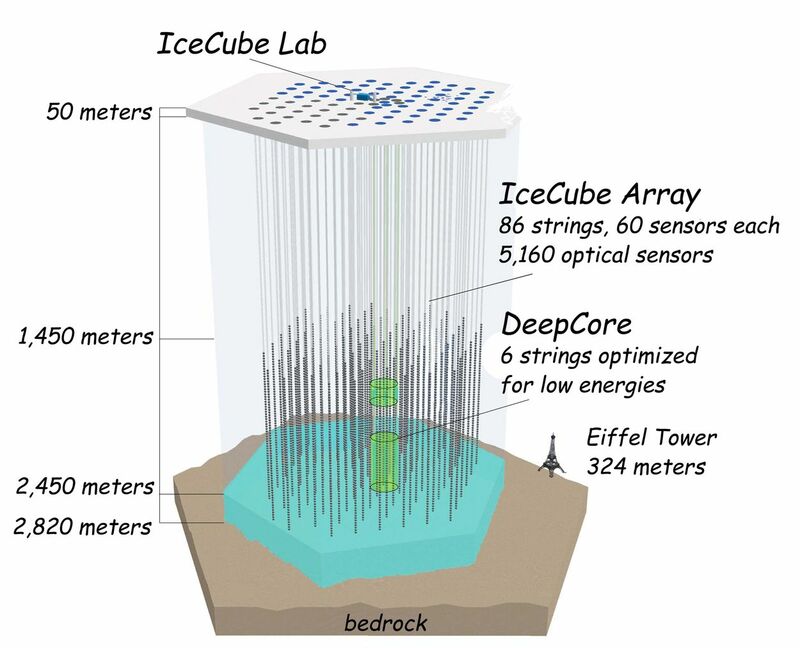 Regarding the rock versus ice; I presume (but I haven’t double-checked) that there are fewer cosmic-ray muons entering SuperK than IceCube, *at a fixed energy*; but since SuperK is trying to measure things at lower energy, and there are more muons as well as neutrinos at low energy, cosmic ray muons are still a real background that has to be vetoed. I forget what technique they use at SuperK to do this. At some point perhaps I’ll write an article on SuperK and recall the details. Let’s see if I got this then… High-energy neutrinos are rarer, but cause a (relatively) bright flash when they interact, low energy neutrinos are more common, but cause a (relatively) dim flash. IceCube has a huge volume compared to SuperK, so it sees more high-energy neutrino events than SuperK. But because it has fewer detectors, it can’t see the dimmer flashes of low-energy events as well. So IceCube, being 20,000 times as large as SuperK (in volume) should see 20,000 high-energy events for every 1 high-energy event that SuperK will (which means, statistically, SuperK will see none), while SuperK, with it’s large number of detectors, can get high-resolution detection of low-energy events that IceCube can’t detect well. Yes, though there may be some subtleties around the edges (literally — SuperK may not be able to use all its volume, while IceCube can use a bit of the region outside its phototubes, especially for the very highest-energy neutrinos.) In getting the right perspective, you should also remember that low-energy neutrinos are vastly more common, but interact less readily with matter, than high-energy neutrinos do, so the low-energy neutrino *collisions* don’t exceed the number of high-energy neutrino *collisions* by all that much. With these two competing effects, that factor of 20,000 in volume apparently buys IceCube about 2-3 orders of magnitude in energy, for the atmospheric neutrinos. The hope is that this is also enough for the astrophysical neutrinos, which should be out there in some measure. Sorry! Your answer generates another question. Why low energy neutrinos interact less readily than high energy ones? Does this follow from interaction Lagrangian? For elementary particles, the interaction probabilities always drop with energy for long-range forces like gravity and electromagnetism. But the weak nuclear force is short-range. For a short-range force, the interaction probability grows with energy, until the energy reaches a point where the wavelength of the incoming neutrino (measured in the center-of-mass frame of the collision) is comparable to the range of the force. Then it decreases. A subtlety is that for some non-elementary particles like protons, cross-sections do NOT decrease with energy. That’s quite subtle, and has to do with the internal structure of protons. The effect of this is that the interaction probability of a neutrino with matter — which at high-energies is dominated by its collisions with the quarks and anti-quarks in the protons and neutrons inside atomic nuclei — actually never decreases. It simply increases less rapidly above a certain energy. IceCube has photomultiplier tubes (PMTs) arranged with 17m vertical spacing and 125m horizontal spacing (arranged hexagonally). The absorption length (the 1/e length) of Cerenkov light that the PMTs are sensitive to is about 100m in ice. A “low energy” muon < 500 GeV produces Cerenkov radiation per distance traveled that is almost independent of the muon energy (depends only on velocity). A < 500 GeV muon loses about 240 MeV/m in ice due to ionization. The PMTs are noisy, producing about 650 pulses per second (from electrons "boiling" off the photocathode surface) so one needs to see many PMTs firing within a very short time span to detect a signal. The PMT noise increases with temperature so having them frozen in ice helps. A muon <100 GeV won't travel far enough to light up enough PMTs to extract a clean signal. This is the source of the 100 GeV minimum energy threshold for detection. The DeepCore part of IceCube has closer spacing of more sensitive PMTs and has a detection threshold of 10 GeV. For muons with higher energy, other processes like bremsstrahlung, e+e- pair production, and nuclear interactions are the dominant sources of energy loss. These produce secondary charged particles that themselves produce Cerenkov radiation which overwhelms the Cerenkov radiation produced by the muon. The amount of Cerenkov radiation per distance traveled in this case is roughly proportional to the muon energy. IceCube can also detect the low energy neutrino burst from a supernova by monitoring the overall firing rate of the PMTs. A low energy neutrino interaction will typically only light up a single PMT but if there are enough neutrinos there will be a detectable signal that rises above the noise rate. Wait, what? A neutrino has a wavelength? Is that akin to a photon? Or is that the neutrino oscillation? Now, I find the term “wavelength” highly misleading in this context, as it suggest a particle/wave nature for the neutrino. It isn’t a wave, and it isn’t a “wavelength” – if anything it is a “oscillation length”. Hmm. Yes, that’s potentially misleading. The oscillation among neutrinos isn’t associated with the neutrino wavelength. You’re right that an “oscillation length” would be clearer. The veto at SuperK is a separate outer detector, a shell of water 2m thick surrounding the main detector. If you see light in both these detectors, it’s a muon passing through the whole complex. If you don’t see light, or only see it at the exit point, then the muon was produced inside the detector. The question is actually : How do we measure neutrino energy? 1) Measure the range of the resulting muon. The range is defined as the integral of 1/(dE/dX) with respect to energy . This scales with energy . Higher neutrino energy–> longer range for the muon. If your detector has a small volume and you decide to use this approach, in order to have accurate energy estimation, the range you measure must be within the boundaries of your array. Therefore you have an upper value of energy you can measure accurately — the energy of a contained muon track with length ~equal to the size of your array. This implies that in instruments with SPECIFIED VOLUME you cannot do very high energy neutrino physics. What’s more, in a contained event you not only measure the muon energy but also the inelasticity of the event (the fraction of neutrino energy which has been transfered to the nuclei of the medium). Therefore adding “range”+”inelasticity” you have the neutrino energy. 2) If you want to measure very high energy neutrinos (above TeV), the approach nr.1 is not valid anymore since muons range out of your array. The effect that you use to estimate energy then is the dE/dx of the muons. Above ~1 TeV, muon’s dE/dx goes as : dE/dX = a+bE –>proportional to its energy. Therefore one has to sample the energy lost by muons per unit path length and estimate its energy. This approach is straightforward, range independent BUT has a main drawback. The energy loss is stochastic (muon loses energy via bremsstrahlung, photonuclear interactions, pair production). Therefore, energy measurement has high fluctuations . What’s more you cannot resolve the vertex of the neutrino interaction ,since muons may originate far from your array–therefore you cannot measure the inelasticity. Therefore, neutrino energy can only be estimated this way with logarithmic sensitivity (order of magnitude estimate). This is the first scetch of how things work. Now the second question is, how do you define the energy threshold of such experiments? The answer is that the energy threshold is inversely proportional to the photocathode area that covers your array..
More closely packed photomultipliers imply lower energy threshold, while more sparsely placed photomultipliers imply higher energy threshold. Because: in both cases you have to do sampling. One needs to take enough ‘points’ to reconstruct a track, and therefore estimate its energy. (say 5 for example?). Therefore your OMs must be very closely packed to detect and resolve the cherenkov light from each point. So, low energy neutrinos imply closely packed photomultipliers. Inversely, when you pack your PMTs closely you impose effectively a low energy threshold. On the other hand in very high energy neutrino telescopes (such as IceCube), your main concern is to increase your effective area in order to have ‘bigger chance’ of detecting the weak astrophysical neutrino signal. This means that you have to place your detection units more sparsely in space. Again, in order to have a well defined track (let’s say for the argument’s sake that you need again 5 points – and that the PMTs are placed 50 meters appart from each other), then the shortest track that you can measure is 5*50=250m long. Since range scales with energy, immediately you have your energy threshold. A typo after Fig. 4: These [atmospheric] neutrinos have a huge range of energies, with the number decreasing rapidly as the energy decreases should be “…as the energy increases”. Another interesting and informative article. Well done. Fascinating and clear! Thanks Matt. And interesting about SuperK too. 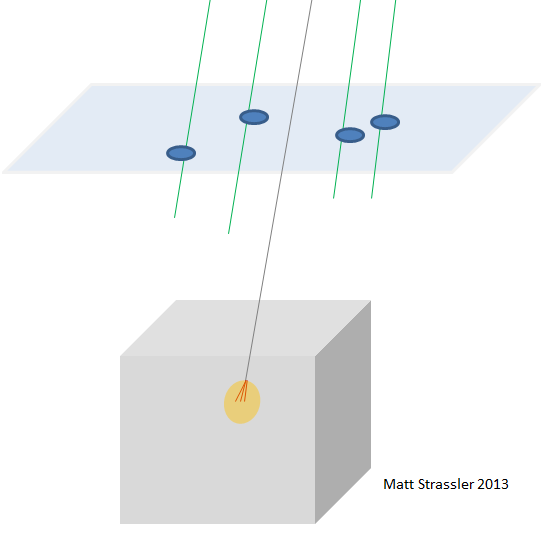 Can the ICEcube detect other hypothesized weakly interacting particles? Dark Matter I.E. WIMPs,, neutralinos, etc What would they look like to the detector if it could? No. Dark matter must be heavy and slow, with motion-energy well below its mass-energy; IceCube is designed to find things that are lightweight and with motion-energies far above their mass-energy. The energy and momentum transfer in these two types of collisions are vastly different. That’s why XENON100 and CMDS have completely different designs from IceCube; they have to look for very low-energy transfer collisions that don’t create a shower of particles, while IceCube looks for very high-energy transfer collisions that do produce a shower of particles. You might also mention PINGU, the plan (construction beginning in the next few years) to instrument more densely the inner core of IceCube, and see neutrinos down to 1GeV. Within a decade they shoud be able to determine the neutrino mass hierarchy from atmospheric neutrinos. How would that work? A quick search gave the answer “PINGU can exploit parametric resonances of earth-crossing atmospheric neutrinos to gain enhanced sensitivity to the hierarchy”, but although I understand the words, the sentence is completely incomprehensible to me. We discuss the neutrino mass hierarchy determination with atmospheric neutrinos in PINGU (Precision IceCube Next Generation Upgrade), based on a simulation with the GLoBES software including the full three flavor framework and parameter degeneracy, and we compare it to long-baseline experiment options. We demonstrate that the atmospheric mass hierarchy sensitivity depends on the achievable experiment properties and we identify the main targets for optimization, whereas the impact of a large number of tested systematical errors turns out to be small. Depending on the values of theta_23, delta, and the true hierarchy, a 90% CL to 3sigma discovery after three years of operation seems conceivable. We also emphasize the synergy with existing beam and reactor experiments, driven by NOvA, such as the complementary coverage of the parameter space. Finally, we point out that a low intensity neutrino beam with a relatively short decay pipe could be used to determine the mass hierarchy with a sensitivity comparable to the LBNE experiment irrespective of the directional resolution of the detector. If you check out the linked article on how to detect neutrinos it is mentioned that lowe energy neutrinos interact LESS often with matter. I do not understand this, but it seems to indicate that high energy neutrinos are easier to detect. The reason that low-energy neutrinos interact less with matter than high-energy ones is because the weak nuclear force is a short range force. At higher energies, where the center of mass energy is above 100 GeV or so, such that the collision is occurring at a shorter distance than the range of the force, it would naively decrease, just as with electron-electron scattering via electric forces. But this is overcompensated by a subtlety, which has nothing to do with the weak nuclear force — just an effect from the fact that the proton isn’t an elementary particle. Electron-electron interaction rates decrease with energy; proton-proton interaction rates, after a certain point, don’t… and the difference is the proton’s structure, compared to the elementary electron. Protons have a complex internal structure that actually makes the rate still increase, albeit slowly. The same is true for neutrino-proton or electron-proton scattering at very high energies. Thanks for the insight. Actually after typing the question (which you answered also) I looked up in a book and realized that weak interaction cross sections increase with energy in simple particle exchange models. This makes it necessary to renormalize. Presumably your argument about the range of forces holds good even after renormalization.In a way you are giving a tuition free particle physics course! That is great! Thanks. Many thanks for this reply. Once again your point out something I have heard but not learned. Looking now the answer is so blindingly obvious. Incredible. None. Neutrino masses (which are less than 1 eV/c^2) will not affect collisions with these energies (which are far, far, far above 1 eV). What neutrino deficit are you referring to? IceCube does not see a neutrino deficit. Thank you Professor, very neat and enlightening. /While Physics may be rusty, he has the mathematics credentials to approach the problem and is highly regarded as brilliant/– Able Lawrence. Consciousness is as fundamental as space, time and matter. The personal reality is very different from external physical reality. Mathematics is not a reality to replace physics, it is only a tool. In physics, space and time have been demoted from their absolute status. They are, showed Einstein, relative to an observer’s point of view. The speed of light is a universal constant, and so is the quantum of action encapsulated in a photon. Mass is phenomenological, it exist only with the relative momentum- energy and mass not the same – but energy is converted into mass ? Particle is a ripple, less than the speed of its field, frozen in the matrix of space time – that we could observe. We could observe photons, eventhough they are massless and equals its field in speed because, the space is “three dimensional” – so there is particle-wave duality ? In context with above article, what means “straight line” in spacetime matrix – for high energy neutrinos and photons to travel. 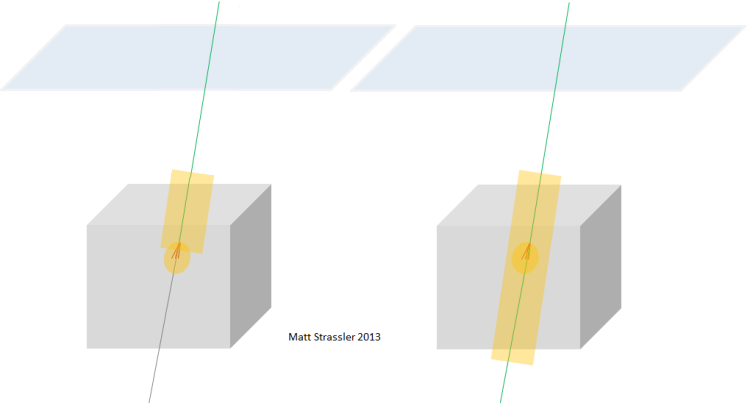 Are they obey the “three dimensional space”, or in high energies go up to Grand Unified Theory (GUT), or toggle between dimensions – that we could at least prove, our space is three dimensional (geometrical spacetime matrix) – by observing them ? I wanted to thank you for the articles your write on physics. After having read many (a dozen or two?) over the past week I must say you make an excellent job on bringing this part of physics closer to laymen like me, without dumbing down the topics (like many in the popular press like to do). However, I must say that I find this article to be a bit confusing. I haven’t finished the article yet, but this example I found must confusing (for me as a laymen). Now I assume that “these protons” are the cosmic rays, and “this acceleration process” and “collisions … within this natural accelerator” are when the cosmic rays hit atoms in the atmosphere, but I fear that switching terminology like that within one paragraph is a unnecessary stumbling block for laymen like me. There are other examples before that (and maybe other examples after that, haven’t finished the article yet) where I had to ask: “What does he describe here?”. I understand that there are different types of events (and hence different sources) that IceCube detects, but when you describe them it seems all a bit mumbled together for me. I think separating more clearly the events that are the target for IceCube, and the events that are “background” (as I believe is the correct term) would greatly help. Maybe I am a bit “thick” today, and maybe I take an exceptionally long time to understand things today, but I feel like this article isn’t as good as the other ones on your website (and it feels a bit piecemeal to me), and I might be wrong, but I think it could greatly benefit from freshly rewriting it. Thanks for the suggestions. If you want to be more specific about other confusing points, I’ll take them under advisement. It’s going to be end of mine day, but before end I am reading this impressive piece of writing to increase my knowledge. don’t copy your competitors, it’s rarely a good idea). It’s awesome to come across a blog every once in a while that isn’t the same old rehashed information. Fantastuc read! I’ve bookmarked your site aand I’m adding your RSS feeds to my Google account. for an easy yet adorable shower gift for guests. What kinds of communications between employees take place on a daily basis. just code of dressing at the workplace.